No More ‘Rub of the Green’ ! If a player's ball in motion is accidentally deflected or stopped by any outside agency, it is a rub of the green, there is no penalty and the ball must be played as it lies. [There are some exceptions]. • There is no penalty to any player. 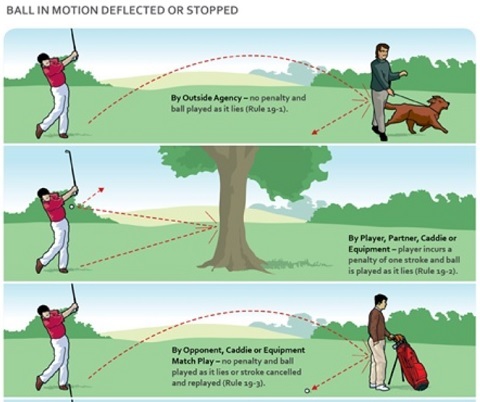 [This Rule goes on to confirm that the ball must be played as it lies and there are similar exceptions to the current Rule]. The point of my headline is that the rather quaint term, ‘rub of the green’, which was originally used in the game of lawn bowls to describe any hindrance or impediment that diverts the bowl from its proper course, has quite rightly been dropped from the modernised Rules of Golf that will be effective from 1st January, 2019, as it is an outdated idiom that most golfers have difficulty interpreting in a golfing context. Having recently started compiling my book of questions, answers and explanations on the new Rules* I have discovered many other changes to the words used, which the Ruling Bodies expect will make it easier for all golfers to read and understand the modernised Rules. Another phrase that does not appear is ‘through the green’, to be renamed as the ‘general area’ of the course, which includes all of the course except for the teeing area the player must play from in starting the hole they are playing and the putting green they are playing to, all bunkers, and all penalty areas. Although ‘bunker’ remains and has a Rule to itself (Rule 12), the word ‘hazard’ does not, as water hazards will be included in the new term, ‘penalty areas’ (Rule 17). I know from the correspondence I receive that many golfers have problems in distinguishing between ‘fellow competitors’ (who are in the same group in stroke play), ‘opponents’ (on the other side in match play) and ‘partners’ (members of the same side in four-balls, foursomes and team events). From 2019 a ‘fellow competitor’ will become ‘another player’ in the same group, which should help clarify any confusion. Some words we have been accustomed to using in a golfing context that do not appear at all in the new Rules are; ‘address’; ‘permit’ (now ’allow’); ‘closely mown’; ‘invalid’ (but ‘valid’ does occur twice); ‘margin’ (now ‘edge’); and ‘stipulated’. Several words and short phrases have subtle changes; ‘abnormal ground condition’ to ‘abnormal course condition’; ‘casual water’ to ‘temporary water’; ‘conditions of competition’ to ‘terms of the competition’; ‘nearest point of relief’ to ‘nearest point of complete relief’’ (another welcome clarification); ‘outside agent' to 'outside influence’; ‘teeing ground’ to ‘teeing area’; and ‘undue delay’ to ‘unreasonable delay’. From January 2019, a ball is no longer ‘deemed’ unplayable, but the player may ‘decide’ to take unplayable relief’; they will not ‘incur’ a penalty, they will ‘get’ a penalty (this is probably the only language change that I am uncomfortable in using!) Two additional, but minimal changes are ‘score card’ becoming ‘scorecard’ and ‘stroke and distance’ becoming ‘stroke-and-distance’. Though it does not appear in the current Rules book, some of us involved with interpreting the Rules have been using the term ‘flagline’ to describe a relief that is sometimes available, e.g. from a water hazard or for an unplayable ball, that keeps the relief reference point directly between the hole and the spot on which the ball is dropped, with no limit to how far behind that point the ball may be dropped. The new Rules use an even better description, ‘back-on-the-line’ relief. In the Rules of Golf, the gender used in relation to any person is understood to include both genders. Most of my subscribers and readers will know that I choose to use the singular form of 'they', which is widely recognised as being grammatically acceptable English, in order to avoid being gender specific, so I am pleased to acknowledge that the R&A and USGA have eliminated this language discrimination in the new Rules by using ‘his or her’ and ‘he or she’ throughout. Well, almost throughout! I have spotted that the word ‘him’ is used twice, in Rule 4.3 and Rule 10.3a, in the published proof copy. Hopefully these can be corrected before the final print! * The working title for my new book is, ‘666 Questions on the New Rules of Golf – 2019’. Please email me at rules@barryrhodes.com if you would like to be placed on a pre-order list, with no obligation to purchase. This eBook's target price is US $12.99 (delivered as both .pdf and .mobi files).